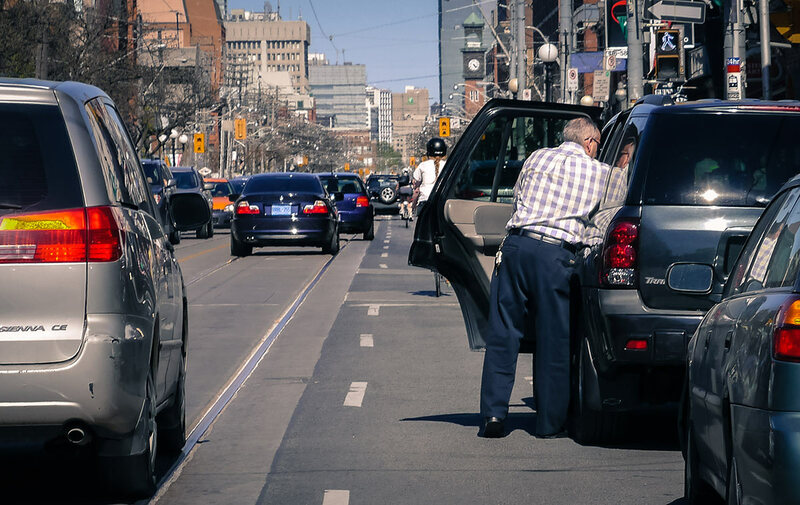 Getting “doored” in Toronto is a borderline epidemic. In some boorish way, it could be considered a sort of initiation to urban cycling, but it doesn’t have to be. For the purpose of gathering statistics, bicyclists can report incidents on doored.ca This will help to adequately address the issue. But in the meantime, having the street smarts on how to avoid getting doored can save you from injury while making your ride more pleasurable. Here are 4 tips that can help you avoid getting doored. Having a bell on your bike is not only extremely useful to alert others of your presence, but in Toronto it’s also required by law. A simple chime will work wonders and people in parked cars who begin to crack open the door will hear it. The bell is also helpful in communicating with other bicyclists and zombie-eyed pedestrians who are about to break into a j-walk. The truth is you can’t do anything in fear. If you’re nervous about riding busy streets or along side cars, your mind will subconsciously switch to tunnel vision. Your eyes will be fixated on everything in front of you, any distraction from behind or the sides can be startling and make it more difficult to quickly respond to potential incidents. Practice riding next to cars on quiet streets if you feel uncomfortable riding in heavy traffic. Being engaged with your environment is really an extension of the previous tip. The key to riding in the city is all about having awareness. In driving school, everyone is taught to consistently look around, check your blind spots and mirrors. The same applies to riding a bicycle. Pay attention to what’s coming up behind you, read the flow of traffic and anticipate what lies ahead. When there are no cars in sight, take up the lane and give yourself plenty of room. This will in turn make you more visible to any car coming up from behind while giving you space. While riding with moving traffic, try to stay either ahead of a car or avoid their blind spot if they pull ahead. But not at the expense of impeding the flow of other bicyclists. If you’re stuck in a situation where a collision is imminent, ride into door. It’s better to hit something potentially soft and forgiving, rather than swerve into traffic and get plowed over by something hard. Hopefully it won’t ever come to that, but also respect the fact that not noticing you, doesn’t warrant getting bowled over. Try to empathize with drivers. They’ve probably been circling around looking for a parking spot and once they found one, need to decipher the signs to determine whether they can park their car, then scramble for change as they explain to someone on their cell phone on why they’re late. Ridding yourself of an us-against-you mentality will keep you more at ease, thus making your ride more enjoyable. If you get “doored” and avoid injury, report it, put it behind you and always keep riding.